Vermont continues to promote the Farmer Veteran Coalition. 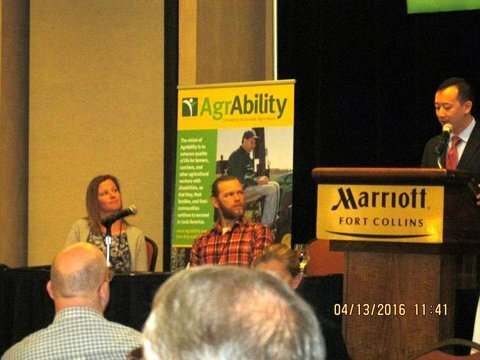 Most recently, at the National Training Workshop in Fort Collins, Colorado, Jon Turner and Tom Younkman both made presentations about the FVC. Jon joined the other three state chapter chairmen who shared their experiences with their state chapters. Tom shared how Vermont AgrAbility has worked with the FVC to get the state chapter in place and is working with individual veterans through the program. The attached picture shows Vermont's Jon Turner and the USDA deputy undersecretary for farm and foreign agricultural services and military veteran agricultural liaison preparing to view the video of farmer veterans that is being produced by the National AgrAbility Project, in which Jon and other veterans are featured.